Catalyst to growth. Engaging with Inbound Marketing. Content marketing that engages with people who are actively seeking information about your product or service category is called Inbound Marketing. Many marketers know this can produce the most immediate revenue results, and it can be the catalyst to revenue growth and transformation. New prospects to drive revenue growth. Research tells us at this moment only 3% of the people in your target audience are buying now and actively seeking the category of what you are selling – not your product or service specifically, rather the product or service offered by you and your competitors. 7% of people are open to your offer. 30% are not thinking about it. 30% don’t think they need it. And 30% know they’re not interested. So, some prospects are ready to buy now, while others are open to learning more about your solutions, and moving toward buying if they are properly engaged. This is where inbound marketing comes into play. By tailoring content to engage both people seeking solutions now and those earlier on in the buying process, gives you a distinct advantage over your competition. You can start the relationship earlier, building trust and the value of your offer before others have a chance. The benefit is you gain access to a far larger qualified market which drives revenue growth. Magnetic content that attracts buyers. Effective inbound programs use content as a magnet – research studies, videos, white papers, landing pages, micro-sites, and other content – that pulls prospects in to learn more about your solution. Leads are captured via opt-in form fill then fed relevant and compelling content to move them along their buying journey on a path to buy from your company and grow your revenue. 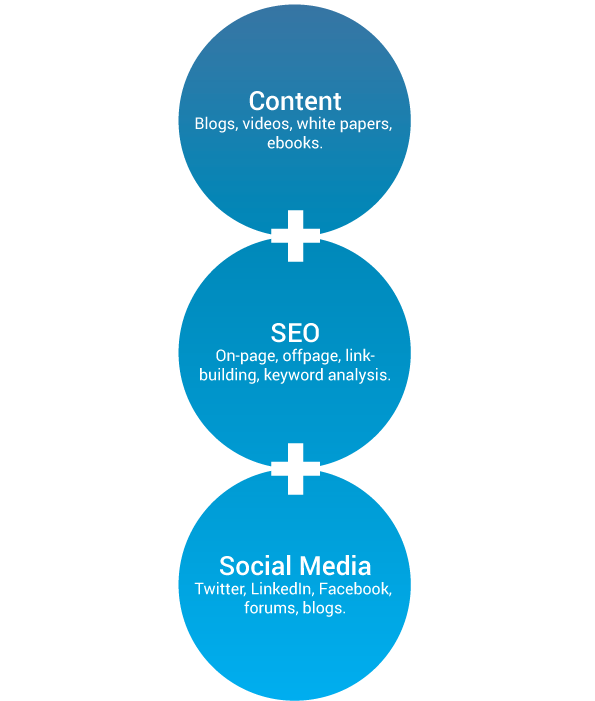 Inbound Marketing solutions from BIG IDEA. BIG IDEA will work with your team to identify what you’ve done to date, what has been most effective, and what we can leverage. We often find opportunities to optimize current vehicles – website, social, ads, and more. We’ll evaluate your competition. And then we’ll review all of your content and opportunities to bring it to a new level along with automated channels of distribution. From there, we will create the right inbound strategy and execution plan to match your revenue goals while integrating with your current marketing and sales programs. This is the inbound process we use at BIG IDEA to gain more customers for our clients. Get Traffic. Create blog content, search engine optimize (SEO) your content, and promote it on social media sites. Great Leads. Place calls-to-action throughout your website to drive visitors to landing pages with forms. Visitors fill out the forms to get the information/content you’re offering and become leads. Get Customers. Send you leads automated emails to drive them along your buying pipeline. Provide your sales team with lead intelligence so they can be more effective with sales calls and relationship development. Analyze. Assess the success of your marketing campaigns, and determine which areas need further optimizations for future success. Defining your target buyer profiles based on your ideal customers. Creating relevant, engaging, and compelling content that educates persuades your prospects. Distributing that content to as many targeted prospects as possible through a variety of methods and channels. Personalizing the content and matching the prospects’ needs and their stage in the buying process, and reaching them when they need it, where they want it.